DAWKINS: Can you show me one error made by Richard Dawkins? If you can show me just one error Professor Dawkins has made, I may be impressed with your pathetic attempts to establish creation! You have asked for only one error, but we will be generous and provide two. Richard Dawkins, (2009) The Greatest Show on Earth, Bantam Press, pp353-354. To help understand this criticism, we need to look at the organisation of cells in the retina. The retina has three layers of cells: one layer of photoreceptor cells that capture light and convert it to electrical signals, and two layers of nerve cells that begin the processing of the image and send the information to the brain. In between these layers there is a mass of nerve fibres that connect these cells to one another and convey the information to the brain. 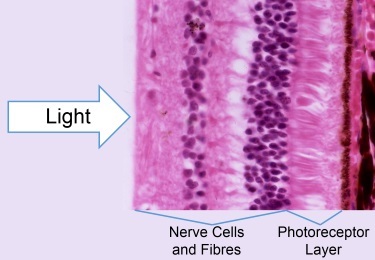 As Dawkins correctly points out, the light sensitive cells are at the back, with the photoreceptor part of the cell furthest from the incoming light, as seen this photo of the cell layers in the retina. This apparent anomaly has been called the “inverted retina,” and has been used to pour scorn on creationists for many years. In spite of this apparent anomaly scientists have known for a long time that the photoreceptors benefitted from being at the back of the retina in order to be properly maintained by a layer of cells immediately behind the retina. (See the row of speckled brown cells in the row behind the photoreceptor layer in the photo above) They also admitted that the retina does work even though it looks odd. Now, when you see something that looks odd, but functions well, the scientific approach is not to write it off as bad design, but to do some more research as find out how it works. This has now been done. This discovery means that light does not have to randomly find its way through a tangle of nerve cells and fibres to get to the photocells, but is conveyed through the retina with minimum distortion. Note this discovery was published in 2007, i.e. two years before Dawkins’ book was published, in a prestigious scientific journal available to anyone. Further research on these cells has revealed how incredibly efficient they are as light conductors, as they not only convey light, but they correct a problem that occurs when white light is refracted by the lens at the front of eye. White light is actually a mix of all the colours of the rainbow. The different colours are different wavelengths of light, and when these are passed through a lens they are refracted (bent) at slightly different angles. These means that blue light and red light from the same source are separated as they pass through the eye by a tiny amount, but it is enough to blur the image on the retina. However, Muller cells have funnel shaped ends and can collect both the blue and red light from the same source, and recombine them as the light is conveyed through the Muller cell to the photoreceptor layer. This means light from the same source is conveyed to the same place in the photoreceptor layer, resulting in a sharp image. An optimal structure is not the blundering mistake of a “complete idiot”, it is the superb design of a brilliant Creator. The belief that the Koala pouch opens downwards comes from observations of joeys (baby koalas) facing downwards when they first start to peer out of the pouch. This is because of an important stage in development of the baby. While it lives in the pouch the baby koala feeds on milk from its mother, like any other mammal, but before it can live independently it has to learn to eat eucalyptus leaves, and its intestines have to be able to digest them. When the joey is about 6 months old the mother starts producing a substance called “pap” in her droppings. This consists of pre-digested eucalyptus leaves mixed with gut microbes that help with digestion. The joey feeds on the pap in order to prepare its digestive system for a diet of leaves after it leaves the pouch. In order to get to the pap the baby has to lean downwards. Dawkins definitely fails on these two examples. However, that is not his real problem, nor we suspect, the problem of the questioner. The real problem is deliberately hiding behind a false theory instead of being prepared to face Christ the Creator, who will judge Dawkins for calling him “a complete idiot”, but has died and risen in order to give Dawkins and anyone else new life if they repent. 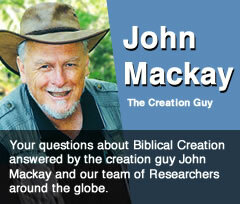 For more answers to the challenges against creation raised by Darwin and Dawkins see the Creation Research DVD Demolishing Dawkins & Darwin, Defending Design & Designer. Available at the Creation Research webshops: USA here, Rest of World here.